The Flylady and her shiny sink! I don’t really believe you have to shine your sink. Not literally. What I DO believe, is that you need to start somewhere when you are trying to get your life in order. And often times getting our life in order means we have to get our houses in order. Because our messy, cluttered houses absolutely cause stress physically and mentally. I read somewhere in another organizing book (don’t remember which one), that one person’s shiny sink might be another person’s made bed or straightened desk. There’s some place in your house that drives you NUTS if its out of order. That stresses you to no end when it’s dirty, messy, clutter, unkempt, whatever. And the reverse…when it’s tidy, clean, organized, you feel peace, joy, love, all is well in the universe for awhile. For Flylady and many others, that thing is the kitchen sink. But if for you this is your entry way or your purse or your bathroom counter… just figure out what that thing is and make that thing the focus of your attention as you attempt to get control of the chaos that is your life. For me, I think it’s my ENTIRE KITCHEN. I may have a clean sink (it’s never “shiny”…it’s old and damaged and not capable of shine anymore) but if the counters and stove are dirty and piled high with dirty dishes….the clean sink doesn’t mean a thing to me. And once you tackle the rest of the house, you will draw energy from your entire home environment to handle the stress and chaos that is YOUR LIFE. Because as homeschool parents, we all know that our lives are downright CRAZY BEANS! So we need all the help we can get!! And a chaotic home is NOT helping us, it’s HINDERING us. So we need to get a handle on it, any way we can. And a Great Summer Purge and Clean (or, insert whatever season you are able to do it in…) is a great way to do this! And it’s a fantastic way to prep for a new school year! 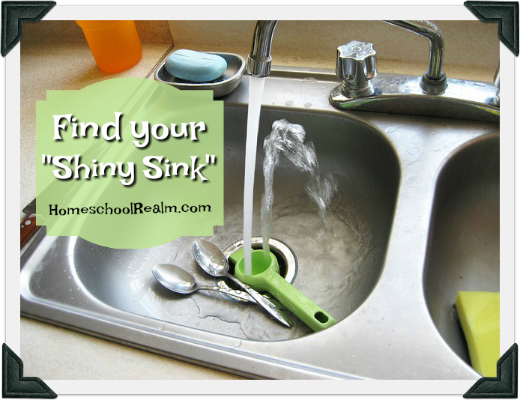 But discover what YOUR “shiny sink” is today! And start working on it, so you can start to draw strength and positive energy from it daily.